Devoted Quilter: Love Worth Celebrating! 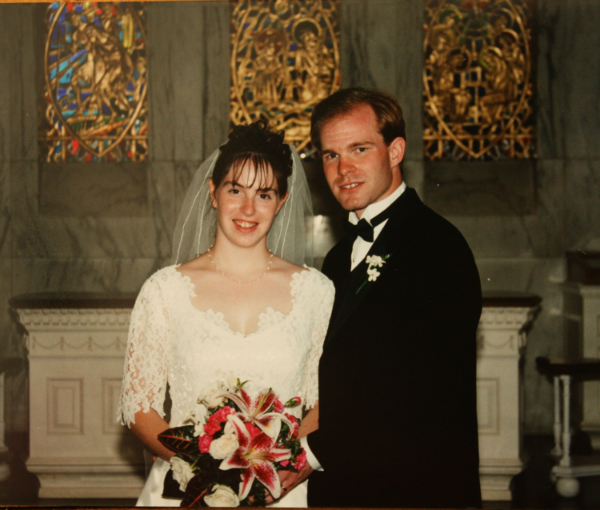 On Friday, Paul and I will celebrate our 16th wedding anniversary. Did you see how we celebrated our anniversary last year? We don't have any plans like that this year, though every now and then Paul does joke about what design we should choose this time around. After 16 years married, no one knows me better than Paul does. He has seen my good moments, yes, but he has also seen me when I'm complaining, or whining, or being selfish. He has been the one to come into the room and quietly let me know when I'm being too hard on one of the boys. Even knowing me as well as he does, he still loves me! Over the years I have unintentionally said and done things that hurt his feelings. And yet, even with that, he still loves me! He has been my cheerleader so many times, encouraging me with my writing, my sewing and with my blog. He tells me he loves seeing the opportunities that have come about because of my blog, and seeing how I have changed because of them. He sees changes in me that I don't really notice myself. Do you have someone who loves you that completely? I really hope you do. If you do, you know that it feels good to know you are loved no matter what, that someone will always be there when you need them, and that someone is on your side, cheering you on. To have, and to give, that kind of love through the years is certainly something worth celebrating. you, Lord, know it completely." God knows about the whining that only happens in my head, about the complaining I do silently, about the judgmental thoughts I have but don't actually share with anyone else. And He still loves me! Isn't it amazing to think that God, who actually knows us better than we know ourselves, loves us enough that He gave us Jesus? One of the most famous Bible verses says, "For God so loved the world that he gave his one and only Son, that whoever believes in him shall not perish but have eternal life" (John 3:16). He loved the world, yes, but the world is made of individuals and He loved each one of us enough to make a way for our relationship with Him to be restored. Two things should be noted about God's love for us. First, that we have to accept it. He loves us, but there are plenty of people who refuse to accept that love. Just as a person has to accept another person's love before they can have a relationship, so we have to accept God's love for us before we can have a relationship with Him. We accept His love by believing that Jesus came and died for our sins and by accepting His gift of salvation through faith in Jesus. As John 3:16 says, 'whoever believes' will have eternal life. Second, God's love for us will never end. Marriages can end in divorce, even after decades of anniversaries, and even when everyone else thought the couple was happy. God's love for us will never change, and never end. James wrote, "Every good and perfect gift is from above, coming down from the Father of the heavenly lights, who does not change like shifting shadows" (James 1:17). If God does not change, then His love for us is constant and will never change. It will always be just as it is now, because He accepts us as we are, through Jesus. That love, then, is certainly something worth celebrating too!